This one pot lamb ragu is a really easy dish to just pop into the oven or slow cooker and forget about it. I love to serve it with the giant pasta shells because all the pieces of lamb get scooped up inside them. Fry the onions and lamb pieces in a little oil until browned. 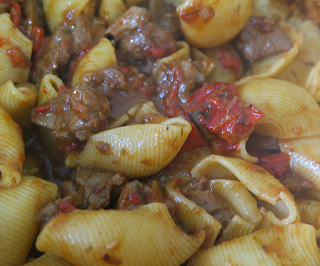 Add the passata, herbs, spices and the stock into a casserole dish with the lamb and onions. Cook for 3 hours in the oven at 150c or 6 hours on low in a slow cooker. Serve with giant pasta shells.